We are a unique entity in the industry, actively committed to offering an optimum quality range of Turkish Style Mosaic Pendant Lamp. 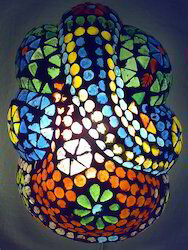 Red colored floral mosaic lamp. Avail from mosaic hurricane lamp that is available in pretty pink with with a shapely green base and matching green finial. The glass lamp casts a soft, flattering glow that's guaranteed to light you up. 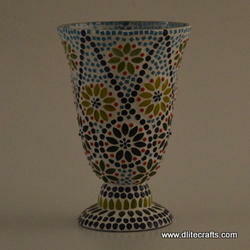 We offer the mosaic lamp in various sizes and look depending upon the requirements of clients. Material: Wrought Iron Base, Mosaic Glass and Matt finished. Colour: Blue, Yellow, Red and Green.